Materials etc. in previous post. The method is the same as in the last two paintings. No medium (more or less), large brushes, small painting. I’m not sure if it is possible to cover a range of different painting types using this method. Maybe a combination of this method and details in the later stages using a liquid paint, similar to the watercolour technique. The restrictions I put on myself, i.e. large brushes/dry paint, are difficult and limiting. Its time to try something different. 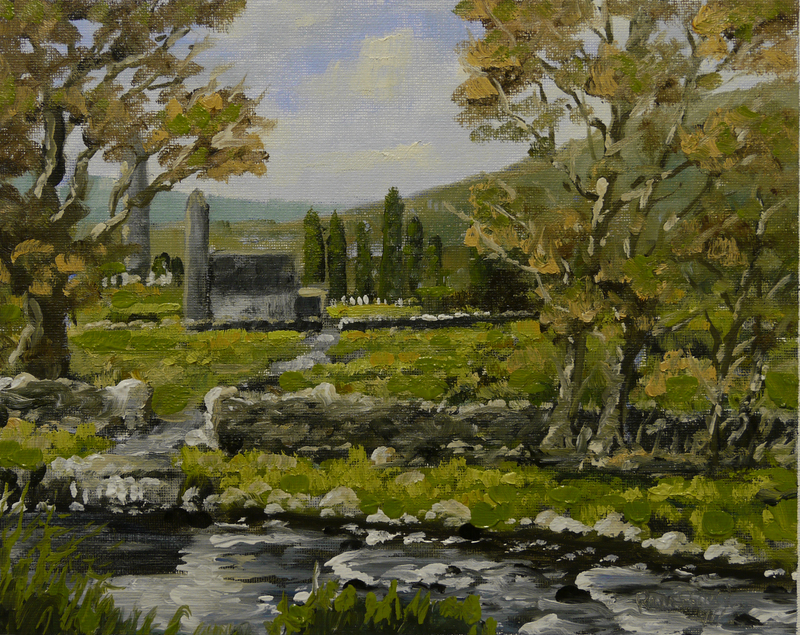 This entry was posted in Oil Painting and tagged Art, Culture, Education, Glendalough, Inspiration, Irish landscape, Oil Painting Instruction, Time lapse painting. Bookmark the permalink. I love this time-lapse video – what an education! I linked to it on my blog, but WordPress embedded the YouTube video instead of linking – sorry about that. I added a text link to your blog as well, so I hope you’ll get some visitors. Thank you for everything. I came across your blog by accident – its great, and yes, you’re very ‘versatile’. Thanks for sharing!